Access and parking in the Playford CBD has changed over recent months as progress continues with exciting new developments in and around Prince George Plaza. 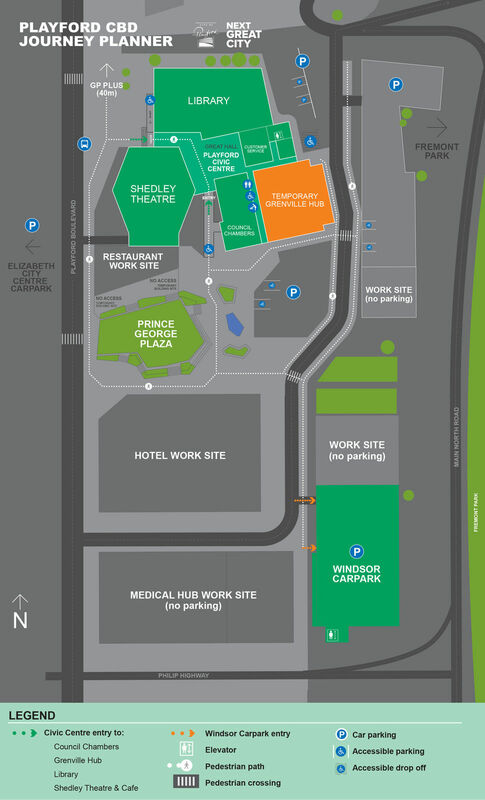 If you are visiting CBD destinations, including the Shedley Theatre and Cafe, Grenville Hub, Playford Civic Centre, Library, Council Chambers and Prince George Plaza, this page contains information and a downloadable journey planner map to help you get to your destination. If you are driving to the CBD, entry is via Playford Boulevard and Prince Charles Street from either Main North Road or Philip Highway (see map). The best parking option is the new Windsor Carpark, which offers free undercover parking (three hours free on weekdays and four hours free on weekends) and extended free periods for Grenville members. An accessible drop-off point and additional disability parking can be found within the off-street parking area at the rear of the Civic Centre, which is marked on the map. If you are visiting our CBD or attending an event, please check this page for the latest map updates for access and parking. As new projects commence construction over the next two years, it will be business as usual for venues and services. We look forward to welcoming both new and regular visitors to our new Playford CBD. Click the link below to download a large-scale printable version of the journey planner map. There are currently no road closures planned for the Playford CBD. The full list of current Council road closures is available on our Roadworks and Road Closures page. See journey planner map above for the main parking areas in the Playford CBD. There are also additional street parks along Prince Charles Street – check signs on arrival. Read the Windsor Carpark FAQ for full details on free periods, extended free periods for Grenville Hub patrons, and standard fees and opening hours. General parking information for the Playford Council area is available on our Parking page. The closest bus stop is outside the Civic Centre on Playford Boulevard. The nearest rail stop is Elizabeth Railway Station at the western side of Elizabeth Shopping Centre. The Community Passenger Network and Home Assist Transport Service provide eligible people in the community with additional transport options. Taxis and Uber rideshare cars can pick-up and drop-off at a variety of locations around the Playford CBD. See journey planner map for the accessible drop-off point behind Civic Centre. There is also a Maven Gig pick up location (rental cars for drivers who need a car to work for rideshare and delivery services) located behind the Civic Centre.